Spring Back Recycling is a unique business model because it has been able to grow while also making a profound impact on a number of lives. I have spent the last few years contemplating what “recipe” of variables have existed to enable this new venture, that couples waste diversion and earned income for formerly incarcerated men, to sustain profitability and even scale. I’d like share what I have personally learned through the conception, development, and implementation of a non-profit that is dedicated to sharing this distinctive business. When Bill Ruff, founder and manager of Isaiah 58 in Nashville, TN, and I first met about 5 years ago to discuss other employment options (outside of an existing social enterprise dedicated to tree and lawn service) for formerly incarcerated men served by his ministry, we started to visit local manufacturing facilities to inquire about their solid waste removal processes. Our general finding was that, absent a true commitment to funding internal recycling operations, many firms (with a concentration in manufacturing and/or distribution of finished goods) contend that solid waste generated in their facilities was too costly to break-down, compile, and freight to a buyer. 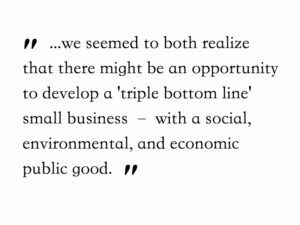 Considering the diversity of textile, plastic, paper, and metal being discarded to landfills due to the economic burden of processing costs, we seemed to both realize that there might be an opportunity to develop a “triple bottom line” small business – with a social, environmental, and economic public good. My immediate questions were around identifying and sourcing solid waste, and then on what the raw material markets would pay for the waste in baled and un-baled forms. Eventually, questions regarding logistics (especially freight) and operational processes for disassembling the solid waste and efficiently baling contents started to form. Fortunately, Bill already had an eager and willing work force that were willing to run an experimental trial and learn from trial and error, assuming we could locate and initially fund basic equipment to pilot an operational model. Of course, as our vision for the model grew, we considered the need for more specific and concrete revenue and expense drivers – knowing that initial funder and/or donated capital would require a formal financial model that could answer the question: How many units or volume of waste would it take to sustain profitability when accommodating varying fixed and variable costs? Eventually Spring Back in Nashville overcame many logistical, operational, and funding hurdles. It today finds itself to have processed over 150,000 mattresses, typically employing 4-6 men, and sustaining profitability with consistent revenue drivers from drop charges and raw material sales. Not only has Spring Back Nashville been able to sustain and grow its model, but the original concept has also scaled to four other geographic regions of the U.S. Spring Back Colorado, Spring Back Tacoma, Spring Back Charlotte, and Spring Back Salt Lake City are all enjoying varying degrees of profitability as each is presently processing hundreds of beds each week. So, I return to my original question. Why write about Spring Back and, more generally, how waste diversion can be an ideal industry to seed and develop a social enterprise? Like our intentions with incorporating a non-profit to license the model, my motivation is very simple – I want to inspire others to learn from our successes and challenges to continue to develop and innovate with similar models. I hope to share my perspective and experiences, as well as what I have observed in other markets and social enterprises that focus on creating earned income for the disenfranchised while simultaneously recycling and repurposing other forms of solid waste. I believe this is how waste diversion and social enterprise can combine to create an economic, environmental, and social benefit that can be scaled and shared in a variety of different forms.